King Garden Designs are expert Tree Consultants, utilizing both Art and Science in promoting Tree Beauty, Tree Health, Tree Preservation and Tree Safety. We have specialized training, education and expertise through our ISA Arborist Certification and TRAQ (ISA Tree Risk Assessment Qualification). We are pleased to provide our clients a full range of Consulting Services: Tree Preservation Plans, Tree Inventories, Tree Appraisals, Tree Valuation (For Insurance or Litigation purposes), plus Pruning, Maintenance, Disease and Pest Identification and Hazardous Tree Identification. As Consulting Arborists we are the authoritative experts on trees, and whose objective, comprehensive viewpoint ensures the safety, health, and preservation of trees. 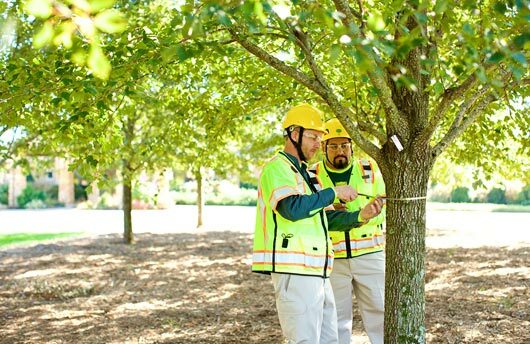 We have an extensive level of knowledge and experience making our Consulting Arborist services valuable to Municipal, Commercial and Residential clients, plus to other professionals. Retainer Fee often covers meeting(s), discussion of case, field work, can include Tree Valuation Report, basic research, assessments, and can include writing up formal assessment and report(s) depending on scope of case. TRAQ is an International Society of Arboriculture Qualification Program that trains Arborists how to use the methodologies outlined in the ISA Best Management Practices for Tree Risk Assessment. This qualification Promotes The Safety of People and Property by providing a standardized and systematic process for assessing tree risk. Trees provide many benefits and value to property owners in functional, aesthetic, social, environmental and even economic ways. Value may be defined as the present worth of future benefits. Many of these benefits can be quantified by a dollar figure, and it is the responsibility of an appraiser to assign monetary value. Appraising trees and living landscape components can be challenging, and requires training, expertise and experience. The purpose of an appraisal is defined by the clients’ needs. These needs may include tort claims, insurance claims, tax deductions, real estate assessment and proactive planning. An appraisal estimates the defined value of personal property, including plants. The tree appraisal process is used to develop a supported estimate of current value. Unfortunately, most appraisals are done after trees have been removed or damaged. This situation requires additional investigation and might include determining pre-casualty value or sampling on a local basis. The best time to conduct an appraisal is prior to any incident or damage. This is rarely done, however. If available, previous site records, tree assessments, site reviews, images and even a witness can help determine the tree’s pre-damage condition. With all the facts gathered, it is the duty of the appraiser to determine the appropriate method and provide an unbiased valuation.